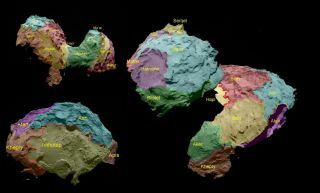 Scientists created this regional map of Comet 67P/Churyumov-Gerasimenko after studying its unique surface features. The surface of a comet flying through deep space is pockmarked with weird features that are keeping curious scientists working with Europe's Rosetta comet mission busy. The European Space Agency's Rosetta spacecraft has spotted strange "goose bumps" and other unexpected geological formations on the surface of Comet 67P/Churyumov-Gerasimenko, the cosmic body Rosetta is now orbiting. The comet's "goose bumps" appear on cliff walls and are estimated to be about 9.84 feet (3 meters) in diameter. Scientists aren't exactly sure how the mysterious features formed on the surface of the comet. Fractures in the same area of the icy body can be explained by cooling and heating as sunlight falls across the comet, but researchers are still trying to figure out how the "goose bumps" came to be. [See amazing photos from Rosetta] "Their origin is yet to be explained, but their characteristic size may yield clues as to the processes at work when the comet formed," ESA officials said in a press statement. This data was captured by the OSIRIS (short for Optical, Spectroscopic and Infrared Remote Imaging System) high-resolution camera that is scrutinizing the comet from as close as about 5 miles (8 kilometers) iabove Rosetta. After arriving at the comet in August, OSIRIS has imaged about 70 percent of the comet's surface. OSIRIS is also on an ongoing hunt for the resting site of the Philae lander, which made a bumpy but successful landing on Comet 67P/C-G in November before officials lost contact with the washing-machine-size probe. Part of Comet 67P/Churyumov-Gerasimenko, as seen by the Rosetta spacecraft about 4.9 miles (8 kilometers) from the surface. Of the regions of the comet imaged so far, scientists have found 19 distinct areas and named them after Egyptian deities, which is a naming theme for all features identified on the comet. These regions are grouped by the terrain that dominates each sector. The five basic regions are dust-covered (regions Ma'at, Ash and Babi), pits and circular structures underlain with brittle materials (Seth), those with big depressions (Hatmehit, Nut and Aten), those with smoother features (Hapi, Imhotep and Anubis) and those with rocklike surfaces, which encompass all of the remaining regions. Based on observations so far, scientists think the comet is about 70 to 80 percent porous, assuming that the comet is made up mostly of ice and water. "The interior structure [is] likely comprising weakly bonded ice-dust clumps with small void spaces between them," ESA officials said. Comet 67P/C-G's northern hemisphere is mostly dust, which gets disturbed as the sun falls across the surface. Heating up the comet causes ice to be released into gas, which forms an atmosphere around the cosmic body. As a part of this process, the gas drags up dust. Particles traveling quickly escape the comet, while slower-moving ones gradually sink back to the surface. "The gases that escape from the surface have also been seen to play an important role in transporting dust across the surface, producing dunelike ripples and boulders with 'wind tails' — the boulders act as natural obstacles to the direction of the gas flow, creating streaks of material 'downwind' of them," ESA officials added. An active region of Comet 67P/Churyumov-Gerasimenko, which is called "Seth" after an Egyptian naming convention. Enhanced contrast (at right) shows "fine structures" of jets inside of one of the pits. Dust activity will likely pick up, and the size of the comet's atmosphere should increase as Comet 67P/C-G approaches the sun. Scientists expect it to make its closest pass with the sun in August, according to ESA. The new results from Rosetta's observations of the comet were detailed in the journal Science last week.